2014 brought the world John Wick, an unexpected, very successful and beloved movie that brought Keanu Reeves back into the world of action movies. Now, the legendary hitman is set to make his return to theaters in John Wick: Chapter 2, which arrives in theaters just in time for Valentine's Day, oddly enough. To honor the occasion, Lionsgate has just released a brand new TV spot, which aired during the Super Bowl pre-game show, which you can watch for yourself online. Lionsgate released the video online in addition to airing it on Fox as part of the pre-game festivities. John Wick: Chapter 2 is going to be coming out on the same weekend as Fifty Shades Darker, which seems to be a more likely Valentine's Day movie. This new TV spot for John Wick 2 is very aware of that fact and has some fun with the idea. There are plenty of moviegoers who don't want anything to do with the Fifty Shades sequel, and John Wick: Chapter 2 is a perfect bit of counter-programming. Here is the official synopsis for the upcoming John Wick sequel. "Keanu Reeves returns in the sequel to the 2014 hit as legendary hitman John Wick who is forced to back out of retirement by a former associate plotting to seize control of a shadowy international assassins' guild. Bound by a blood oath to help him, John travels to Rome where he squares off against some of the world's deadliest killers." The first John Wick was very successful and took many fans and critics by surprise. The movie made $86 million worldwide working from just a $20 million production budget. 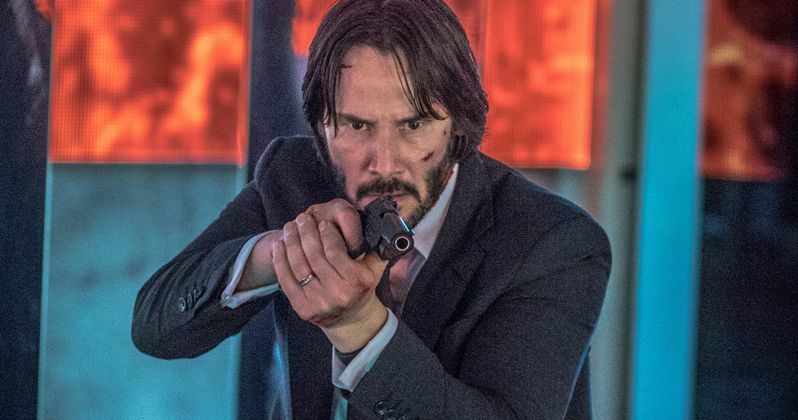 In addition to Keanu Reeves who is returning as John Wick, Ian McShane, John Leguizamo, Bridget Moynahan, Thomas Sadoski and Lance Reddick are also returning for this chapter, but the sequel has also added some new cast members for this go around. Riccardo Scamarcio will be playing the new villain, Laurence Fishburne is coming on board as an assassin known as The Bowery King, making this something of a Matrix reunion. In addition, Common, Ruby Rose and Peter Stormar are also set to appear in the movie. John Wick: Chapter 2 will not only be facing some stiff competition at the box office from Fifty Shades Darker next weekend, but Warner Bros. also has The Lego Batman movie hitting theaters, which looks like it will be bringing in some serious cash, given the very positive early buzz. That said, if anyone can fight through overwhelming odds and competition, it is John Wick. Chad Stahelski is directing solo this time around, after co-directing with David Leitch on the first movie. John Wick: Chapter 2 is set for release on February 10, 2017. Be sure to check out the brand new Super Bowl TV spot for John Wick 2 for yourself below.